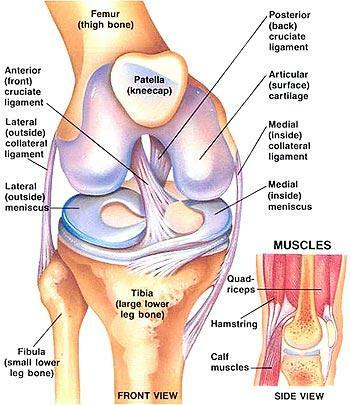 There are four major ligaments in the knee that provide stability to the motion the knee undergoes. The two interior ligaments are the anterior cruciate ligament and the posterior cruciate ligament and they prevent the tibia (the lower leg) from slipping forward and backward on the femur (the upper leg). The two outside ligaments are the medial collateral ligament and the lateral collateral ligament and they prevent excessive valgus stress (inward force on the knee) and varus stress (outward pressure on the knee). These ligaments are all very strong and take extreme force to damage. High speed running combined with quick lateral or twisting movements are often enough to overcome the normal restraint of the ligaments and can cause strains and in severe cases complete tearing of the ligaments. The most common ligaments to injure are the medial collateral ligament and the anterior cruciate ligament, and they are often injured together. Although the ligaments are most commonly injured in high speed accidents, they can be injured in certain degenerative and arthritic conditions as a result of chronic straining to them. Someone who suffers a ligament strain or tear will usually report an incident of high speed running combined with a quick turn or lateral movement that created the initial pain. They will often report a popping sound, although that is not always present, and swelling can range from instantaneous and looking like a balloon to almost none at all. Pain is not always present, especially when the anterior cruciate ligament is the sole ligament injured. After the injury any use of the knee that puts stress on the damaged ligament will create pain and often a loose or slipping feeling. When there is a suspected ligament injury the severity of the injury needs to be assessed which can be done with a thorough examination and in many cases an MRI will be necessary. Once the severity is determined treatment can be started based on the intended goals of the person who has been injured. Most cases can be handled well with conservative chiropractic care and in cases where surgery is needed co-management with chiropractic care will help speed up the recovery process. If you or someone you know is needlessly suffering from knee pain and dysfunction come into Advanced Healthcare and have Dr. Pisarek design a customized treatment protocol that will have you on the road to living pain free today.